Car graphics can be as simple or complex as you like. We offer full design with text, graphics and photos all built to suit your exact make and model. What separates car graphics from any other type of sign is the wide variety of colors and styles you can use as opposed to just about anything else. For window graphics and monument signs it is usually best to use high contrast, simple lettering for quick direction and identification. 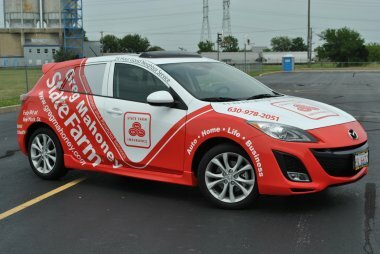 Car wraps allow you (and us!) to get far more creative. You want something that people will notice quickly but that has lots of detail for people to marvel at when the vehicle is parked. You can have flame effects in the background for a Barbeque restaurant vehicle or mountains for a Denver towing company. Couple that with foreground photographs or logos and now you have a billboard with lots of color and visual appeal that people will remember. We will wrap any and all cars new or old but there are a few things to keep in mind! Your paint must be in good condition. 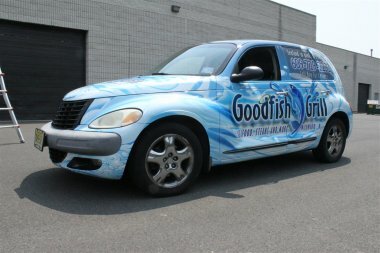 Car wrap vinyl has a tough time sticking to bare metal or low energy surfaces such as bondo filler. If you are going to get a new paint job and then have the vehicle wrapped we will recommend that the paint be given a month at the minimum to cure on your vehicle. All of these steps are necessary to make sure you get the maximum life out of your wrap. We always cover our premium vinyl graphics with a clear lamination that will extend the life of your wrap by protecting against road grime and fading from the sun. We also cover and protect visible edges whenever possible with clear 3M Edge Sealer.